Our Silly Teddy Bear puppet is just too cute to pass up! “Silly Bear” is made of high quality teddy bear fur that is very soft and furry. 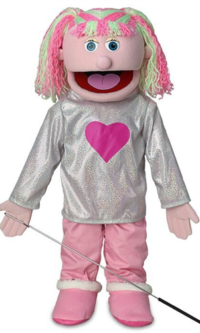 Children and adults of all ages cannot resist holding, cuddling, and snuggling with this cutie! 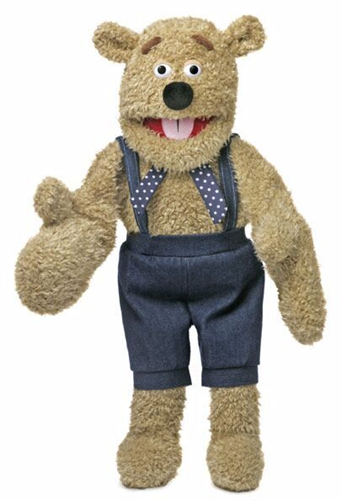 The best part is that not only is he an adorable teddy bear, he’s also a fully functional muppet style puppet! 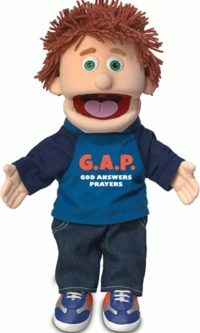 His mouth as well as his arms and hands are completely movable. He comes dressed as shown- wearing denim overalls and polka-dotted scarf. 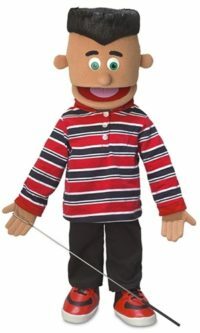 However, his clothes are removable and can be changed with any child size 18 month-2T clothing!Insert your hand into the slot in the puppet’s back to operate mouth.